Home to hundreds of millions of people, the semi-arid regions of Africa and Asia are particularly vulnerable to climate-related impacts and risks. Working in 11 countries in these regions, ASSAR is a research project that seeks to understand the factors that have prevented climate change adaptation from being more widespread and successful. This article features ASSAR's work in Eastern Africa. To read about the project in other regions please see their respective articles. East Africa is characterized by great topographical diversity and a range of local climatic conditions. Annual rainfall cycles are complex, and rainfall variability is the main climate and weather element affecting ecosystem services, agricultural production, and socio-economic development of the region, with frequent drought and flood events. Rising population and high population growth rates in the region are important drivers of change, potentially greatly increasing demand for food, water and livestock forage. Population redistribution via sedenterisation, migration and urbanization are also key dynamics. East Africa has a largely agrarian political economy. 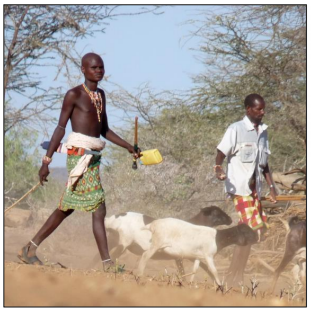 Local communities are highly dependent on rainfed crop production and, in the dryland areas, pastoralism (livestock) and agro-pastoralism (crop-livestock mix) for livelihoods and employment. East Africa is one of the most food insecure regions due to frequent climate risks. Long-term development plans (e.g. Kenya’s Vision 2030, Uganda’s Vision 2040, Ethiopia’s Growth and Transformation Plan) aim to transform into industrialising middle income nations. Huge capital investments target service delivery expansion. This is constrained in semi-arid areas by: remoteness, low population density, pastoral mobility and poor infrastructure. Communal conflict and resulting population displacement and migration have challenged regional security and peace. Climate change is bringing a new dimension to East Africa’s vulnerability and food security. The region is considered highly vulnerable to climate variability and change, partly due to low economic and institutional capacity to deal with impacts. Broad evidence at the regional level supports increasing trends in temperature from climate baselines. Mean temperatures across the region have increased by 1 to 3°C over the past 50 years. Rainfall trends over the past 50 years are less evident than for temperature, with large variations in the direction and magnitude of changes across the region. Future projections of annual rainfall change are highly uncertain, with considerable variation across models, some indicating potential increases and others decreases. The projected increases in average annual temperatures range from no change to 4°C by 2050. Given the multi-sectoral nature of the risks described above, it is also the case that response needs are broad in scope. Even if we were to narrow the analysis to specific dynamics caused by climate change risks we would also see the need for a broad range of response measures, because the environmental and social impacts of climate change alone are so complex. Relevant sectoral strategies relate to ecosystem protection, pastoralism support, crop production, urban planning, water management, environmental health, disaster risk reduction and climate information services. Key responses that focus support for livelihoods and wellbeing cover: knowledge and awareness, extension services, livelihood diversification, social safety nets, gender focused approaches, relocation and migration and risk sharing. Across these response fields are actions that may act to reinforce pre-existing adaptability, promote innovation, or, at a most radical level, seek to bring about transformative changes. 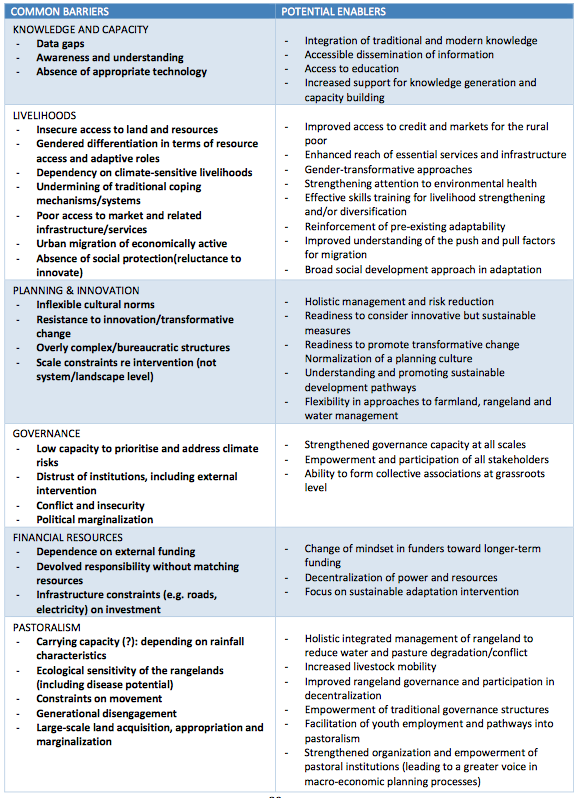 All this underlines still further that climate change adaptation cannot readily be viewed in isolation from wider societal and environmental concerns, and hence we refer to responses within an ‘adaptation-development spectrum’. This also draws attention to how actions conventionally regarded as adaptation-focussed or development-focussed may serve to reinforce or, at times, undermine one another. One of the primary objectives of ASSAR is to try to identify barriers and enablers to the reduction of vulnerability to climate-related risks, especially for poorer and marginalized populations. 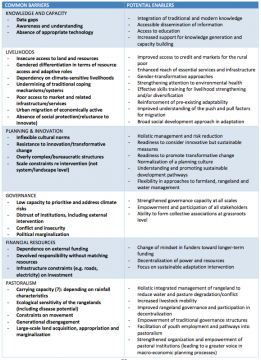 From the RDS work, we can begin to sketch out some of these factors, and see how they broadly relate to themes around knowledge and capacity, livelihoods and access to resources, planning and innovation, governance dimensions, and financial resources. Particularly important for the region is the way these interact with the current dynamics affecting the future of pastoralism. Despite a wealth of research and investigation reported in both academic and grey literatures for East Africa, there remain major gaps in knowledge on vulnerability, and responses to climate-related social-ecological risks remain wide and diverse. Many facets of these issues remain little explored by researchers or poorly communicated to stakeholders. Some of the key knowledge gaps cover: climate data and its effective dissemination; linkage of climate-related risks to development; dynamics in the strategies and actions of pastoralists; the ways in which risk response and adaptation activities are implemented and assessed; the appropriateness of blueprint response strategies; the role and limitations of livelihood-based adaptations; the potential of local and ‘indigenous’ knowledge; the governance context of risk response and adaptation; drivers behind policy developments; the role of wider environmental and political economic changes; and understanding social trade-offs that exist in responses to risk. Key barriers and enablers to vulnerability reduction are summarized in the table below. Table 5 from page 89 in report: Preliminary identification of key barriers and enablers to vulnerability reduction. Click to enlarge. 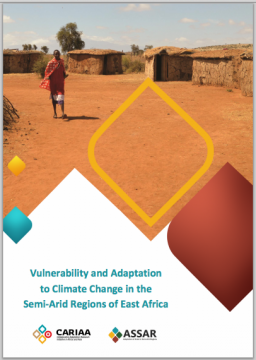 Vulnerability and Adaptation to Climate Change in the Semi-Arid Regions of East Africa. From SlideShare. Click to read full report. Click to see the main weADAPT ASSAR page. ASSAR on University of Cape Town's website.